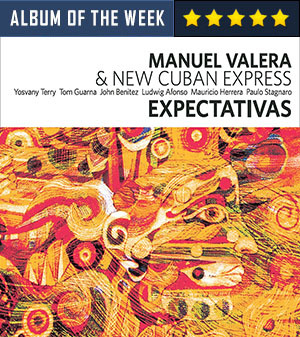 Manuel Valera and New Cuban Express seem to have picked up from where they left off. Their album Expectativas has the same vigor and the same energy as its Grammy-nominated predecessor, New Cuban Express (2011). And while Mr. Valera may be continuing in that vein: that is the innovative use of Afri-Cuban rhythms to forge a new relationship with the idiom of jazz, this record, Expectativas brings something new. This is a rather visceral energy that bubbles and boils over in the underlying rhythmic inventions, but that is topped over by a more sophisticated polyphony that bathes the harmony, while the rhythm continues to agitate and excite what music is made in that proverbial crucible. It is like an exotic hydrocarbon produced when the elements are churned in a vessel, that being the piano of Mr. Valera. Immediately the wonderful throb and exquisite swaggering dance by the instruments—chiefly that of that other ingenious musician, Yosvany Terry, who yowls and yelps on soprano saxophone; growls and wails on alto and spikes his music with masterful percussion colours on the chékere. Meanwhile Manuel Valera has been around the block a few more times with his steady band; he has travelled and broadened his perspective. For instance, his “Chennai Express,” about a train in Southern India gets more complex, not only capturing his Afri-Cuban roots, but also adding the inflections of complex Indian Carnatic polyrhythms. With this chart, Mr. Valera seems to be pushing up the gauntlet to his ensemble up a few notches. This is not a challenge that any of the wonderful percussionists shy away from. Drummer Alex Afonso takes up the thread from Eric Doob and Paulo Stagnaro the percussionist with a colourist’s palette not only swings with delight, but also broadens the canvas he shares with Mr. Afonso as well as the indefatigable Mauricio Herrera, who appears on “Chamber Timba” and then on batas while he turns in a fine performance on “Isabelita”. That Mr. Herrera does not play more is a real pity as he has an uncanny empathy for both the pianist and also bassist John Benitez. Surely he was missed. Expectativas is all about music that is sophisticated and that which digs deeper into the consciousness. There is verve and suave dancing figures, but that is the state of the art of Afri-Cuban polyrhythms. The music appears all grown up after the first blush of the new thing that Mr. Valera had created for his previous album. However, this is not to say that Mr. Valera forgets the depth of his Cuban roots altogether. Here, for instance there is a spectacular vehicle for the pianist in a form that glorifies the Afri-Cuban cultural idiom to the fullest. 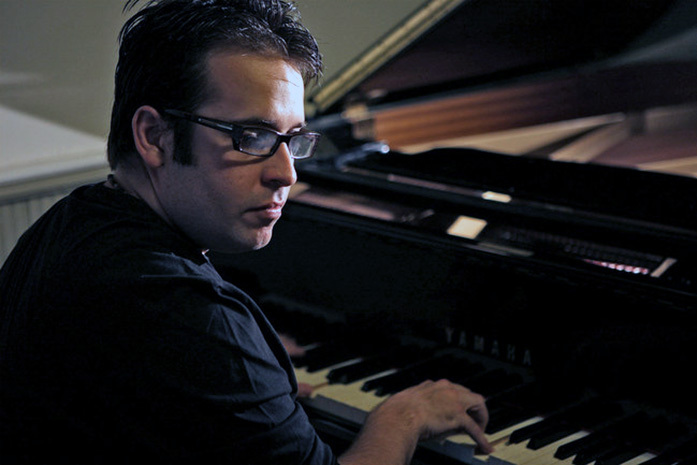 In “Descarga Para Frank Emilio” not only does Mr. Valera pay homage to one of Cuba’s greatest pianists from another pioneering era, but he also shows where he himself comes from: the heart of the great Frank Emilio Flynn. The album ends with a superb portrait of Mr. Valera’s surroundings. “Las Americas” is a poignant farewell to the music of this album, and it hints at a new direction for Mr. Valera and New Cuban Express. Listeners can just wait with bated breath for the next big one from Manuel Valera and New Cuban Express. Track Listing: Chamber Timba; Expectativas; Perception; Chennai Express (For S.A.M. ); Intro To Isabelita; Isabelita; Jben Timbus (For John Benitez); La Gloria Eres Tu; En Cinco; Open Window; Descarga Para Frank Emilio; Las Americas. Personnel: Manuel Valera: piano, Fender Rhodes, synthesizer; Yosvany Terry: alto saxophone, soprano saxophone, Chékere; Tom Guarna: electric guitar, acoustic guitar; John Benitez: electric bass; Ludwig Afonso: drums; Paulo Stagnaro: percussion; Mauricio Herrera: percussion (1), Batás (6); Manuel Valera Sr.: alto saxophone (8).